Subscribe to the show through RSS at http://feeds.feedburner.com/yilunaudiotours to check out the show's archive, which includes exciting episodes covering USS's Halloween Horror Nights 2011, "Live" walking tour of Universal Studios Singapore, Audio Walking Tour of Singapore River, City Hall, Civic District, Fort Canning, and more! Traveling through Singapore just got easier. This is a consolidation of the series of articles I've posted for the past few months. Though this map is slightly old, and does not show the construction progress at the east zone of RWS, it is still very informative, and shows us lots of details on the layout of the resort. 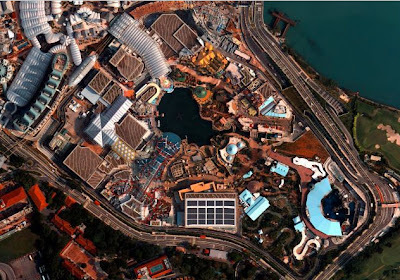 Let's start with the basic layout of the entire Resorts World Sentosa development. This integrated resort is located on the North side of Sentosa island, facing mainland Singapore. 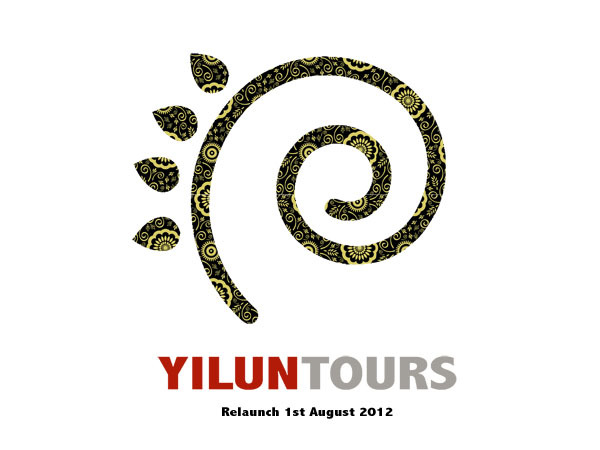 The resort is split into 3 main areas, the West zone, Central zone and the East zone. Let's begin with the park itself. 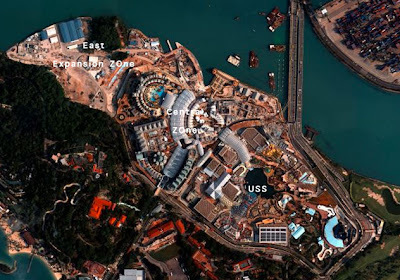 Universal Studios Singapore is a highly compact park located at the West zone of the resort. 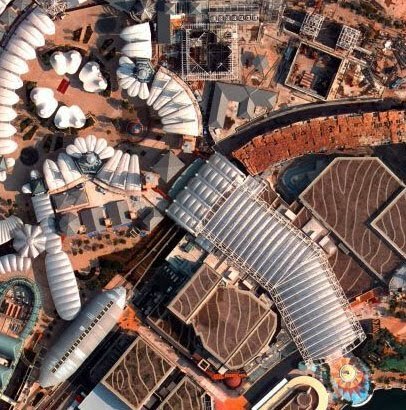 It is surrounded by the service roads leading in and out of the Sentosa Island on three sides, and the monorail track on the fourth. The park, as you can see, is very built up, and has little empty spaces within its boundaries. The entrance of the park. 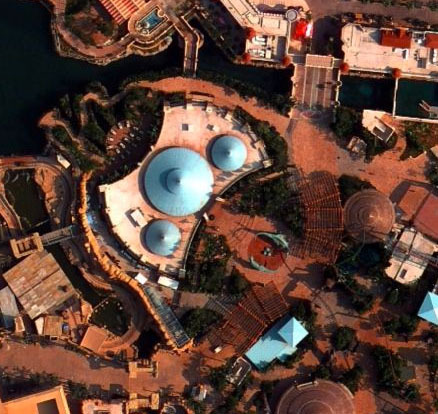 As can be seen from the image, the entire entrance plaza is highly shaded, and the Universal Studios globe is located in the center. The entrance of the park is located directly under the pair of monorail tracks that links Sentosa to mainland Singapore. The entire Hollywood area is under the shades of the canopy. To the right of the entrance plaza, you can see a really interesting channel behind the Madagascar show building. This is the maintenance boat channel of the ride. Here's a bit of speculation: there are two blue rectangular objects floating in the channel. Were the original boats to the ride blue? Looking at the layout of the Pantages theater, you can roughly see 3 distinct sections to the building. The front facade with the spire is visible. The first section of the building, the lobby, is the narrow arched shaped portion behind the facade. The next section is the main seating area. You can see that the seating area starts with a broad back, and tapers towards the stage. Finally, the stage area is the small rectangle at the very back of the building. You can see that the stage isn't very big relative to the entire building. Behind the stage, you can see the backstage loading docks used to bring in big set pieces to the theater. You can of course see the Brown Derby hat store sticking out from the side of the theater. Mel's Dine In and KT's grill. You can see the distinct curve of Mel's Drive In next to the lagoon. You can also see KT's grill attached right next to Mel's, and I bet that both restaurants share the same kitchen. 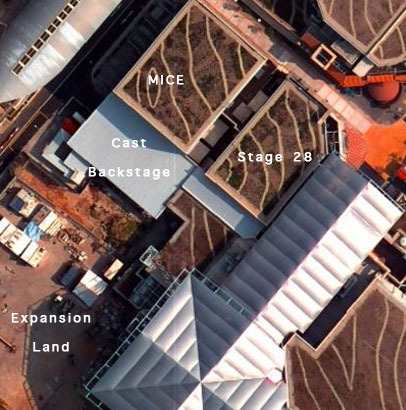 Moving on to New York zone of the park, the first major building is the Stage 28 soundstage. 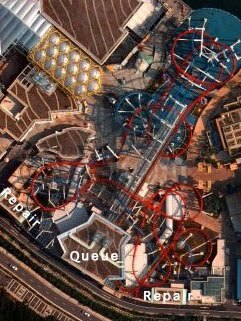 As you can see, the stage is actually made of 2 distinct soundstages, perhaps one for the walk-through attraction, and one as a MICE venue? Halloween Horror Night's maze was built at the rectangular soundstage next to the monorail station. Located right next to the Soundstages is the backstage area, as seen from the corrugated metal roofing. Right next to the cast members' backstage area is a huge patch of open space currently undeveloped. 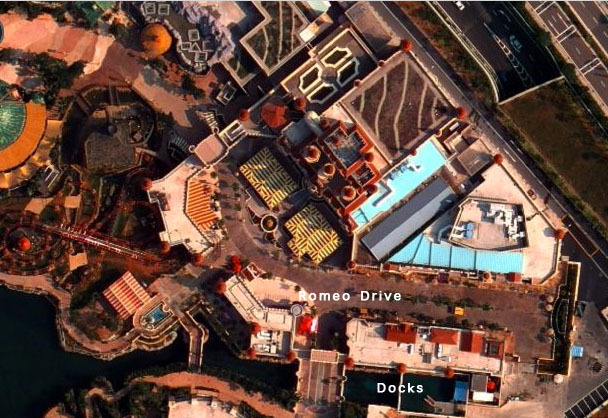 This is a really nice spot for expansion, with nearly enough space to fit an attraction the size of Transformers. Given that this plot of land directly faces the New York street, it is then highly likely that a future attraction might be built here. Next to this patch of land is the rather uninspiring air-conditioning compressor tower. Moving on, as you can see, the New York street is really just a thin facade constructed with no structure behind it. The Rockefeller center facade and the New York Public library facade leads to nowhere. Lights, Cameras, Action is housed in another rectangular soundstage, right next to the lagoon. As you can see, the queue to the show is housed under the corrugated metal roof right next to the small alleyway of New York. The building also shares the space with the Sci-Fi city restaurant, as one side of the building faces the Sci-fi city area. The still vacant Sci-Fi stage is located at the side of this showbuilding. Speaking of Sci-Fi city, the Transformers ride building is located behind the New York Public library facade of New York street. This show building is not very big, and wedged in this awkard location. Adjacent to the showbuilding is the queue building for the Transformers ride, with happens to house the gift shop as well as some toilets too. The Accelerator ride is wedged in this small plot of land between the walkways and the Battlestar Galactica ride. As for Battlestar Galactica the ride, the queue for both sides starts off at the plaza, before meandering under the track paths, before finally heading into the indoor queue building. 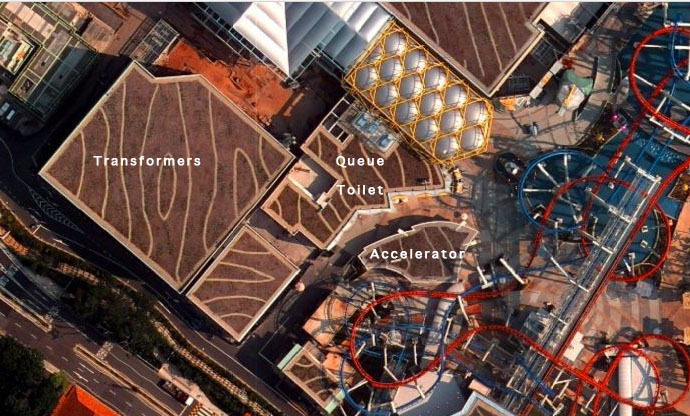 It is actually the same building for both sides of the queue, and the loading station is actually just next to each other, separated by a thin wall. You can also see the two vehicle repair stations at the extreme ends of the ride. Moving on to Ancient Egypt. The monstrosity of a building in this zone is the Revenge of the Mummy ride building. 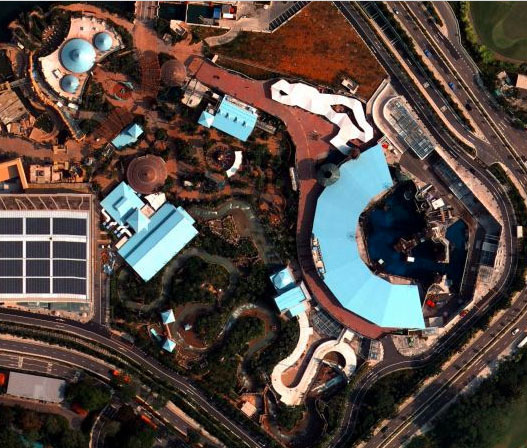 As you can see, the entrance facade of the building is off-center and tilted with reference to the ride building. 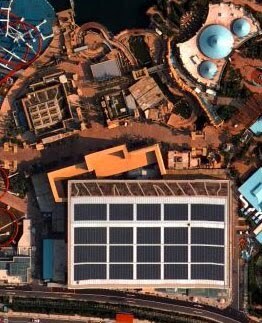 On the roof of the show building is also the largest Photovoltaic roof of the entire resort. The ride exits from the right of the building, and you can see the small gift shop attached to the massive show building. 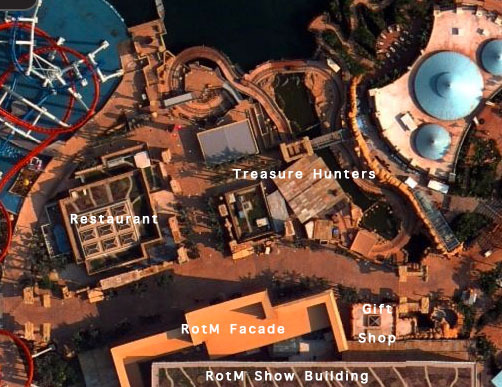 The ancient Egypt zone also contains a restaurant and Treasure Hunters ride. The restaurant is a small building located across the pathway from Revenge of the Mummy the ride. The Treasure Hunters queue building across from the restaurant. The ride path for Treasure Hunters is essentially a 8 that spans the waterfront area of the zone. Next up is Jurassic Park. 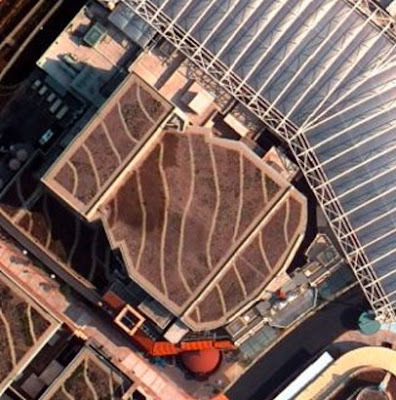 Jurassic Park food court. Nothing interesting here. The Jurassic Park area is really a small tangle of paths with small carnival rides well hidden in thick vegetation. The Canopy Flyers ride is anther attraction shaped in an 8, with a tight loop over the splashdown area of Jurassic Park Rapids Adventure. Amber Rock climb is a pathetic slab of artificial rock bolted to the walls of the Waterworld theater. 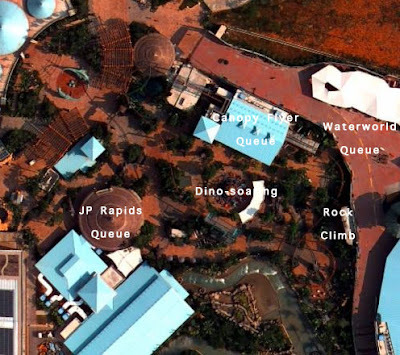 The Jurassic Park Rapids Adventure is actually compacted into a very small plot of land, with the ride path wound into many S turns. This compact layout gives rise many interesting features. The Parasaurolophus lagoon is directly back to back with the final splashdown, the rocky section of the ride is constructed to hide the boundaries of the park and the indoor show building of the ride. 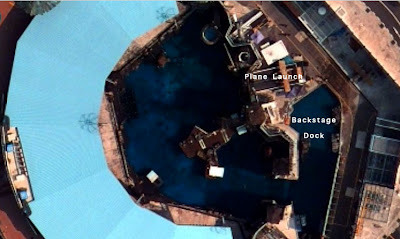 The indoor section of the ride is really just a boat channel with walls and a roof built over it, and the final splashdown is just two small elevator shafts. 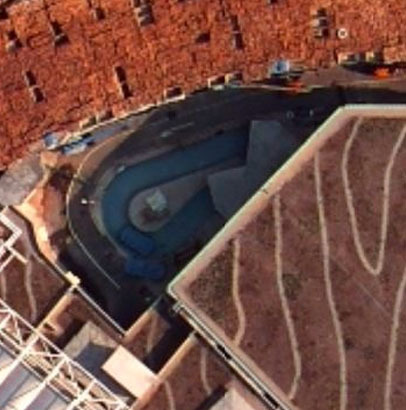 The Waterworld stadium is a classic C shaped amphitheater with a lagoon in the center. 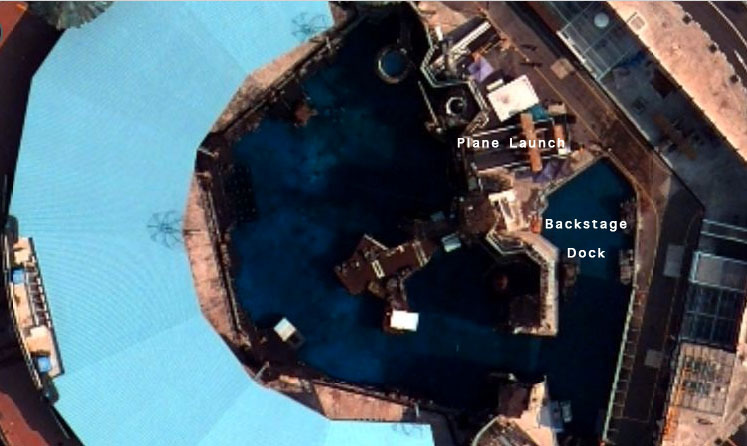 There is a small backstage lagoon at the right side of the stage, where the vehicles are parked when no in show. You can also see the tracks where the water plane launches from behind the stage facade. Over here is also where the backstage perimeter road is the most obvious. There is a curious plot of land beside the Waterworld queue, which also leads to the back portion of the Romeo Drive in Far Far Away. Perhaps this is also a possible spot for expansion? It is sizable enough to hold an attraction like Madagascar. Moving on to the Shrek area. Far Far Away is an interesting land, consisting of a main thoroughfare and many side meanders, as well as Romeo Drive which dead ends at a smokers' zone. 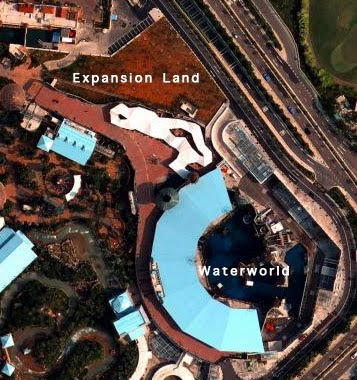 There is a small stretch of water channel that flows between FFA and Lost World. This is the docks where boats and the like can park, and easily go into the lagoon. Shrek castle has a really interesting layout. 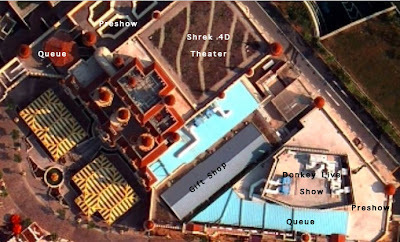 On the left side of the building houses the Shrek 4D theater, and we can see from the Ariel map that the rectangle to the left is the preshow area, while the big rectangle behind the castle is the main theater. The theater empties out into a long corridor in the middle of the building, which is actually the retail shop. On the right side of the building, facing Romeo Drive, lies Donkey live. 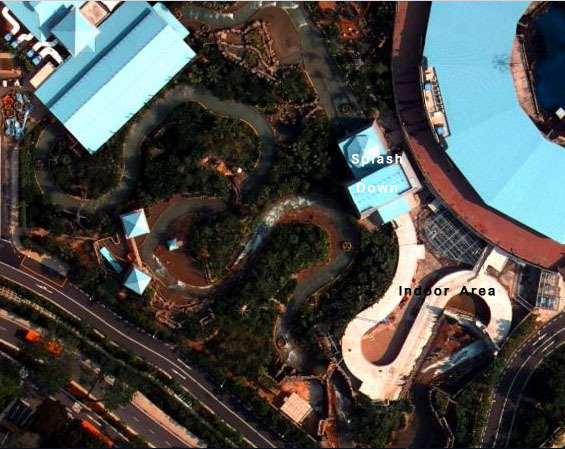 This attraction's queue is hosed under the blue roofing, while the preshow building is located next to it. The main show space is marked by the rectangular box and lots of air condition pipes above it. The main show area empties out into the same central axis which is the gift shop. The kiddie coaster at FFA is highly compact. 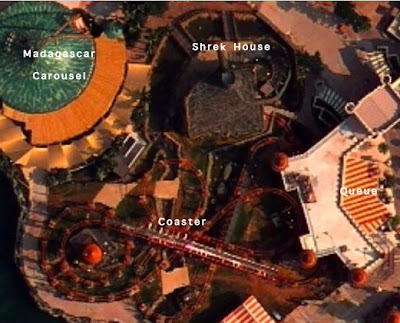 Next to the tracks is the Shrek house where he meets the guests. Finally, Madagascar. 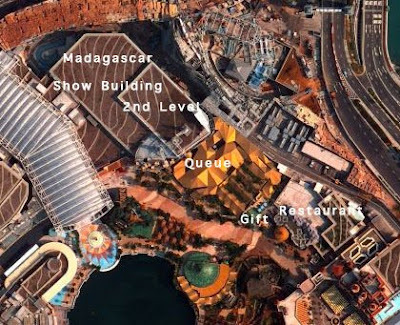 The restaurant in Madagascar is shown by the big building here. The slightly raised area is the kitchen, while the rest of the building is the seating area. The Madagascar ride show building is really interesting. It consists of the queue and the main indoor show building. The queue is the bright yellow area you can see from the picture. The main show building is clad in a facade that is made to look like a big cargo ship. 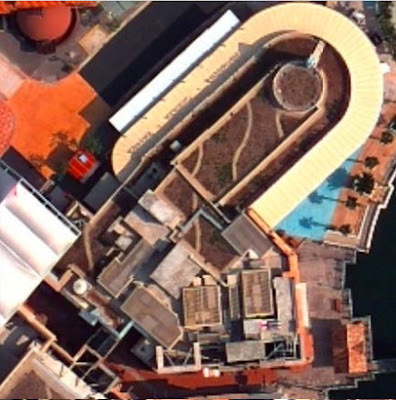 The slightly raised portion of the show building is where the rumored second level of the ride is (which is abandoned due to technical difficulties). The ride exits to a small green hut at the other end of the queue, which happens to be the gift shop. That's it. Hope you have enjoyed this article.